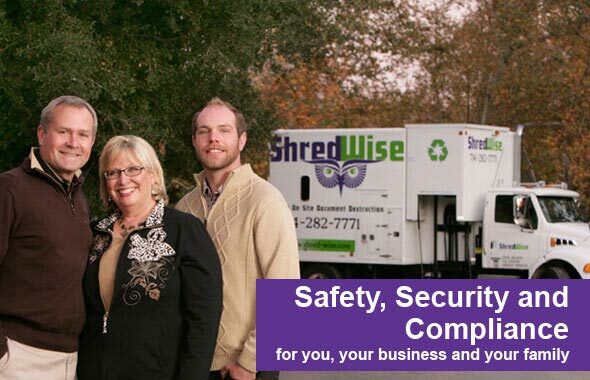 Shred Wise Inc. offers local shredding services for businesses and individuals in Orange. These services can be provided at your home or business, or at our facility in Orange, California. Either way, we’ll take the necessary precautions to ensure that your sensitive information is kept secure throughout the shredding process. Our shredding services meet today’s strict privacy law requirements, and are 100% effective at destroying your documents. To verify that we properly shredded your documents, we issue a “Certificate of Destruction” upon completion of every job. 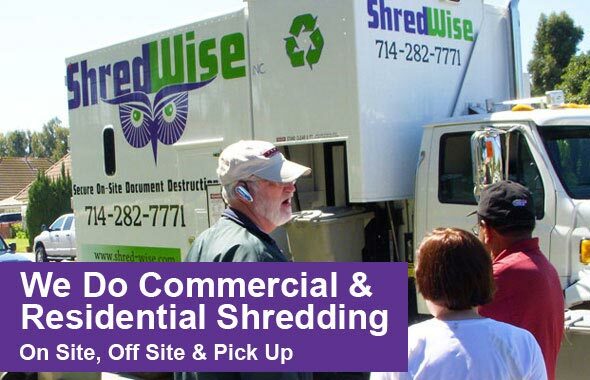 Shred Wise has been providing on-site mobile shredding services to Orange area residents and business owners since 2006. This service is not only convenient, but also exceptionally secure. We follow NAID’s recommended shredding practices for optimal security and effectiveness, and invite our clients to witness the destruction process themselves. They can watch us use an automatic curbside lift system to empty their containers in our shred truck and then view our onboard shred cam to watch the actual document shredding taking place inside our truck. Because our shred trucks have the ability to shred more than 6,000 pounds of paper per hour, use a highly effective pierce and tear shred technique, and feature a compactor that mixes your shredded paper with thousands of pounds of other paper, mobile shredding is significantly more secure and efficient than trying to do it yourself. Small amounts of boxes only, but if you have a handful of boxes and want to drop them off, Shred Wise drop-off is your convenient option. Our ongoing shredding services are ideal for offices of all sizes in Orange. Ongoing shredding services are typically scheduled on a weekly, biweekly, monthly, bimonthly, or quarterly basis based on a simple service agreement. These agreements and feature simple, straight-forward language, which means no hidden fees and no long-term commitment. They also set up the frequency of our visits, guarantee our rates for one year, and state that you can use our secure shred containers at no additional cost for the duration of our services. 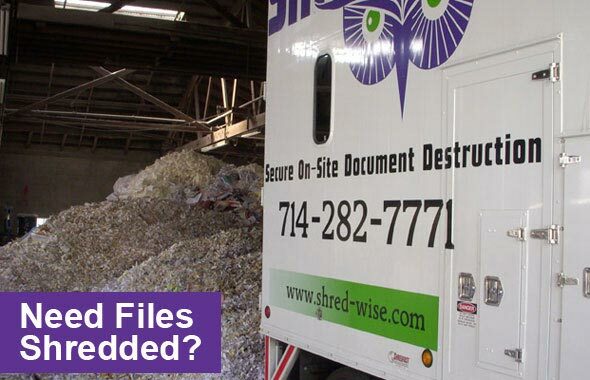 When it becomes time for our clients in Orange to purge a large amount of sensitive information from their offices or archives, we will send out a mobile shred truck for a one-time, on-site purge. This service follows our strict document destruction protocols and ensures that your confidential documents are kept secure from start to finish. As with our on-site shredding service, we use our mobile shred trucks, which are capable of shredding 6,000 pounds of paper per hour, to shred your paper and then transport a mixture of all the paper we shred to one of our preferred recycling centers. Your shredded paper will be 100% recycled, and we will issue you a Certificate of Destruction once the process is complete. Call today to schedule any of the above document destruction services for your needs in Orange. We can often accommodate same-day and next-day requests, and make it easy for you to be added to our route schedule. Our Experience: Since 2006, we have been providing mobile shredding services to individuals and businesses in Orange and throughout Orange County. We have worked with thousands of clients across a wide array of industries, and understand their diverse needs. We not only understand how to provide them with the paper destruction services they specifically need, but also offer helpful advice to reduce their risk of identity theft and data breaches. Our Reputation: We’ve been a member in good standing of NAID for eight years now. As an active and committed member, we work hard to meet their high standards for information destruction. This is why our staff receives constant training on proper document destruction; we use highly secure shred trucks and bins; and follow the industry’s best practices for paper transportation, shredding, and recycling. Our Secure Shredding Process: Shred Wise has gone to great lengths to keep our clients’ sensitive information safe and secure throughout every step of our shredding process, which is why we have designed our shredding protocols on those outlined in NAID’s “Compliance Toolkit.” We’ve carefully vetted our staff and provide them with continuous training to ensure that the proper shredding process is followed with each and every job. We use state-of-the-art commercial shred trucks that feature high-capacity rotating blades to effectively shred large quantities of paper before transporting your shredded paper to a secure recycling facility. Additionally, we make our locked shred containers available to our clients for secure storage in between visits, and make it easy for them to witness the destruction of their papers. Top-of-the-Line Shredding Equipment: Shred Wise uses the most secure and effective shred trucks available today. Our shred trucks feature industrial rotating blades, onboard shred cams, fully automated lift arms, and a shred hood for added security. These trucks can shred up to 6,000 pounds of paper per hour. We also provide our service agreement clients with free consoles and bins to store their sensitive documents. These shred bins and consoles are kept locked and satisfy privacy law stipulations. Flexible Service: Because Shred Wise is a local shredding business, we are able to accommodate last-minute shredding requests promptly without having to charge extra fuel or administrative fees. We believe in taking care of our clients and going out of our way to make them happy. So, we don’t lock them in long-term contracts or charge them for requests that we consider to be part of providing good service. As a result, we have hundreds of loyal clients, high ratings on Yelp, and a high rate of customer referrals. Green Practices: We recycle 100% of the paper we shred–guaranteed. Contact us today and speak with an information destruction expert. Based upon years of training as well as first-hand experience, our staff appreciates the importance of secure document destruction and is happy to help you protect your identity, family, business, employees, and/or clients. Whether you have a few files to shred or several pallets of paper to destroy, we’ll make sure you get the best paper shredding solution for your needs in Orange.